Keeping Myself Amused: Could you take a peek? The entire month, a part of me has wished someone with a video camera would break into my house for the sole purpose of looking in my fridge. Their hope may have been some sleazy expose on how horribly people eat at home. Maybe there were other episodes showing the dark and moldy side of celebrity lives when you open that one door in the kitchen. 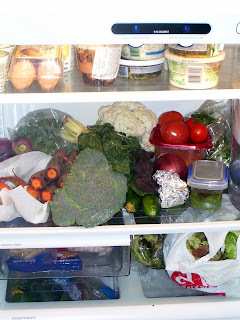 I however would be gleeful, giddy and ready for the cameras when they came and opened up my fridge. And, I would just step back and tell them to behold the beauty!